Shares of Nvidia dropped as much as 3.24% Tuesday after Reuters reported the company is suspending all self-driving tests around the world following a fatal crash involving an Uber self-driving car in Arizona last week. 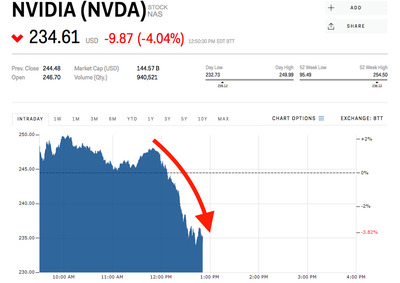 An unnamed source told the wire service of the suspensions as Nvidia CEO Jensen Huang took the stage to announce several new products, including GPU chips and other graphics programs, at the company’s annual GPU Technology Conference in California. Uber has also suspended tests of of its self-driving cars following the pedestrian death.